Craziest (but wildly effective) online casino promotions ever. Anyone who’s ever tried to run a business, big or small, understands that marketing is the key to success. It’s not just about reaching one customer, or a few customers, but getting the word out to a mass of potential clientele. One online casino has mastered the art of viral marketing, leaving behind a wacky history of insanely genius PR campaigns. It all started back in 2004 when the online auction site, eBay.com, was just reaching its initial pinnacle of success. There were some wild things going for even wilder prices on eBay that year. The clever marketing team at online casino GoldenPalace.com decided that if these items were going to make major headlines, so were they. In July of that year, the online casino posted the winning bid of €28,050 to buy a David Beckham missed penalty kick ball. That got the media stirring, so they decided to go bigger. In November 2004, the company saw a ‘golden’ opportunity on the auction site. 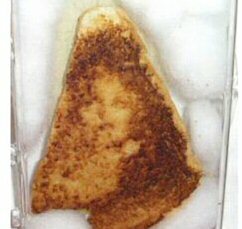 GP spent $28,000 on a 10-year-old grilled cheese sandwich some say bore the scorched-in image of the Virgin Mary. That story went global, as did the news of Golden Palace’s purchase of the sanctified sandwich. On the heels of that enormous marketing success, GP upped the ante big time. On March 3, 2005, the company spent a whopping $650,000 to acquire the naming rights of a newly discovered species of monkey, then known as the Madidi titi monkey. Not anymore. Now it’s the “GoldenPalace.com Monkey”, or by its official zoological branding, “Callicebus Aureipalatii”; wherein “aureipalatii” literally translates to “Of the Golden Palace”. Barely three weeks later, the online casino was at it again. But this time, the company was targeting individuals to promote its brand. GP paid $15,199 on an eBay auction posted by a woman known as Terri Ilagan. Or at least, she was known as Terri Ilagan. Following GP’s winning bid, she’s since had her name legally changed to GoldenPalace.com. Things got even crazier in June 2005 when GP made its most famous purchase to date. Karolyne Smith of Salt Lake City, Utah was in dire need of some cash, so she did what any perfectly intelligent woman would do. She decided to sell something of value on eBay. Always one who enjoyed the center of attention, she didn’t sell the usual family heirlooms or limited edition collectibles. No, Karolyne chose to sell her forehead… or at least the space upon it. She posted an eBay auction with a ‘Buy it Now‘ option of $10,000 inviting any company to bid for the space on her forehead. 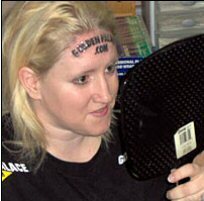 The winning bidder would receive a tattoo of their company logo right across her noggin. It garnered a massive amount of attention, working its way up to the #2 most watched item on eBay. As such, it came as no real surprise when GP’s marketing crew swooped in and pressed the Buy it Now button. Not one to go back on her word, Ms. Smith made her way to the tattoo parlor where (following a 7-hour failed attempt by the tattoo artist to talk her out of it) her forehead was inked with the title “GOLDENPALACE.COM”. As usual, the media went crazy with the story, and Karolyne earned the nickname “Forehead Goldie”. It was subsequently reported in 2012, after the federal government declared online gambling illegal in the US, that Golden Palace paid to have the tattoo removed from Ms. Smith’s forehead.